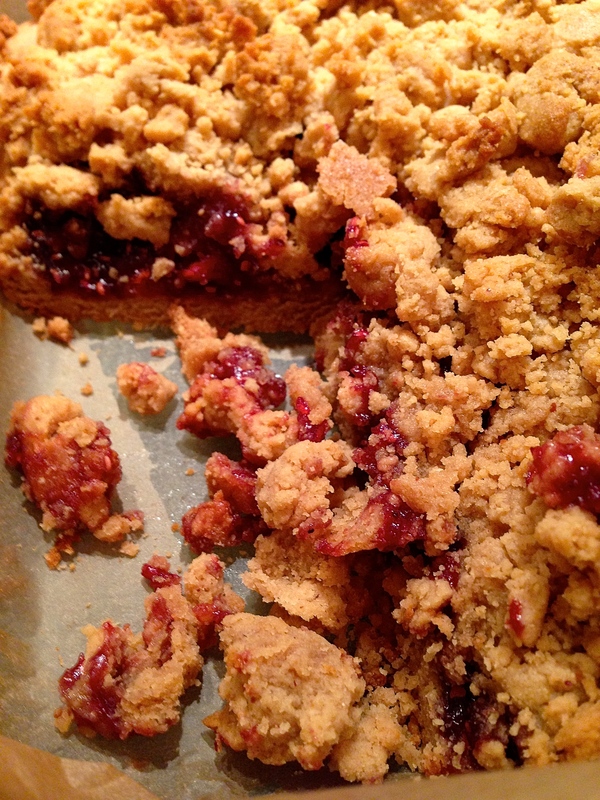 Since every good American loves a PB&J sandwich, I thought I would try my hand at a PB&J dessert bar recipe that I found in Real Simple last year (here’s the online version). As a side note, if anyone else wants to talk about really enjoying what I lovingly call “40-year-old woman magazines,” please come find me. I’m gonna be honest, Real Simple was not joking around: this recipe calls for a lot of PB&J. It gets a little messy and it certainly isn’t a healthy recipe, but they are delicious. And the recipe lends itself to variation – it calls for raspberry jam and raspberries, but you can definitely use your favorite jam flavor and its corresponding fruit. My mom and I thought we might try to make them sometime with a bag of chocolate chips in the middle instead of jelly, but I guess that intense love of chocolate is what sets Wittelsbergers apart from the rest. 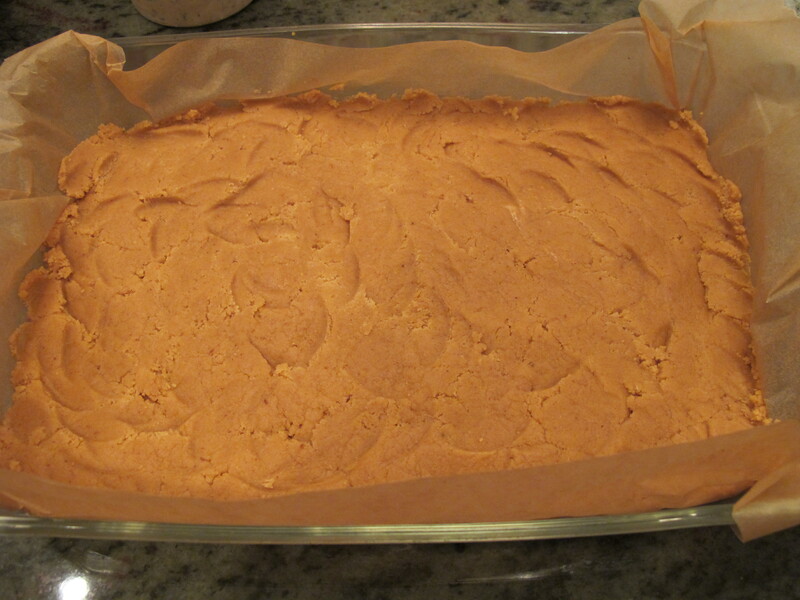 Butter an 8×8 inch baking dish, then line it with parchment paper. 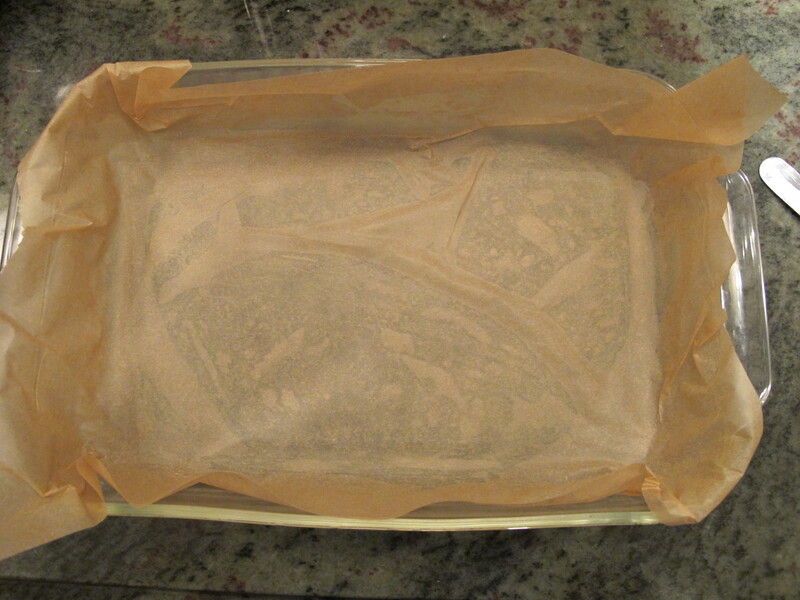 You can butter the dish using the wrapper from the butter you’ll use later, and as for the parchment paper, you can kind of just cover the dish – see my untidy version below. Mix jam and berries in a small bowl. In a separate bowl, combine flour, salt, and baking powder. 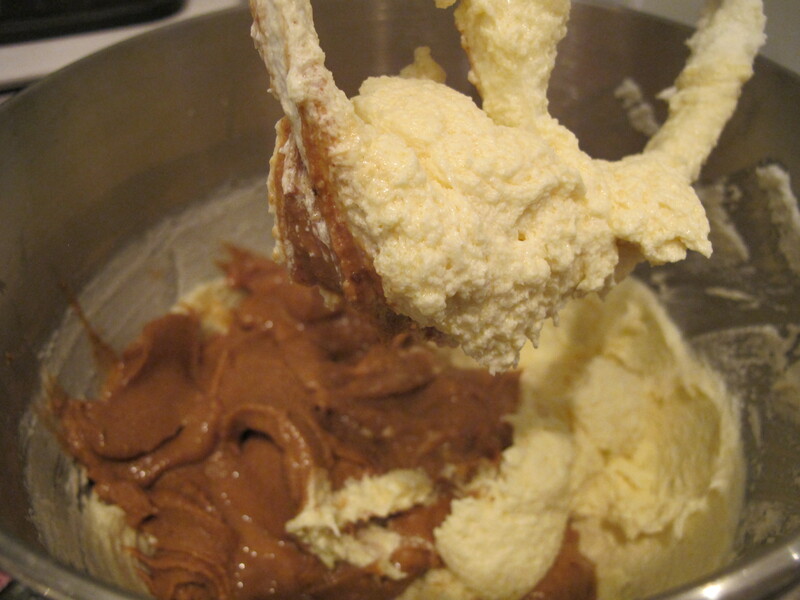 Add butter and sugar to a large bowl and beat with an electric mixer on medium until fluffy (this takes about 3 minutes – you will think it’s ready at about 1 minute, but leave it in and the mixture will get much fluffier). Add in the egg and vanilla extract and beat until combined. Then add the peanut butter and do the same. 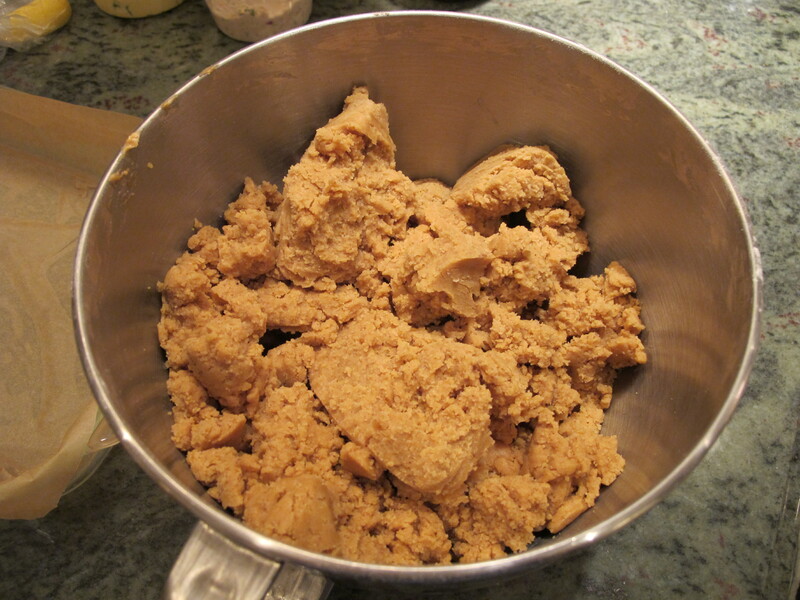 Gradually add in the flour mix to this peanut butter mixture – add a little bit, mix until just combined, and then add in more (you’ll repeat this about 5 times or so, but don’t worry too much about the exact number – the main idea is to not dump the flour mix in all at once). At this point, the mixture will hold well and look like a nice peanut butter cookie batter. 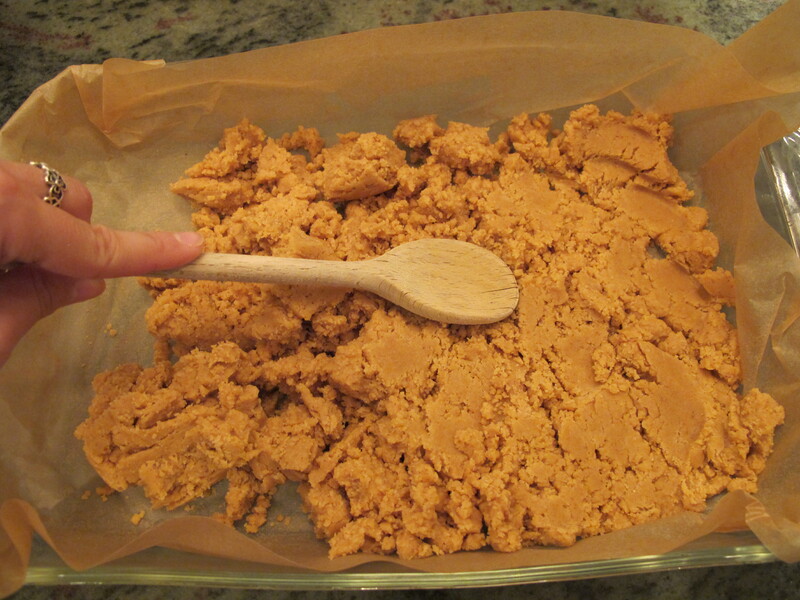 Take out half of the peanut butter dough and press it down into the dish. 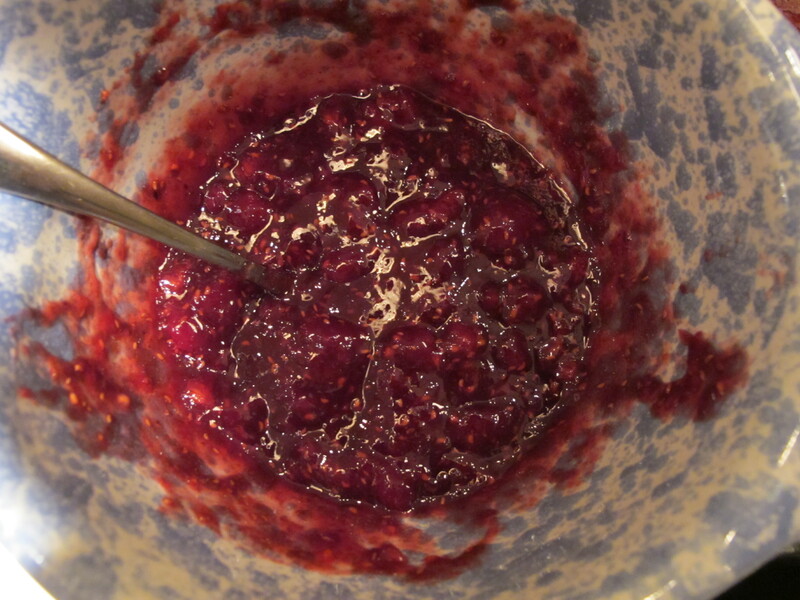 Add all of the raspberry mixture, and smooth out so it’s evenly distributed around the dish. 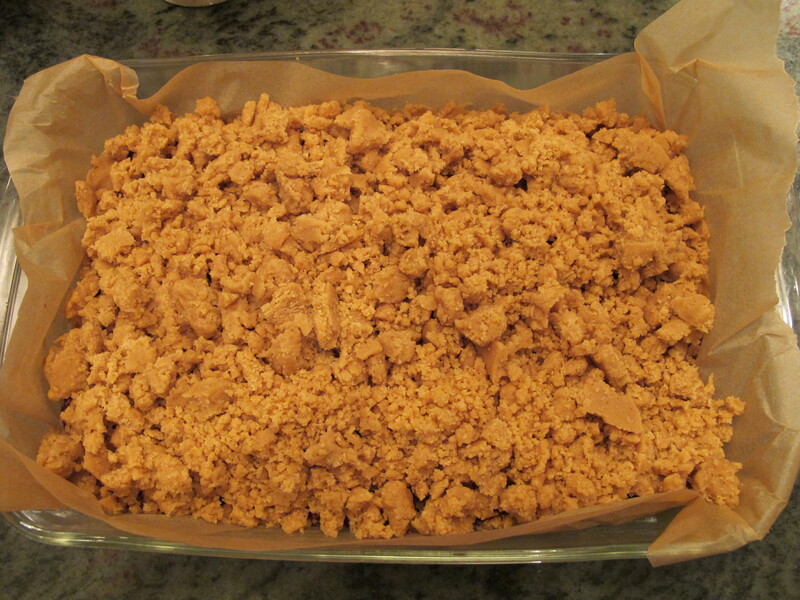 At this point, if you want to use the peanuts, mix them into the remaining peanut butter dough. I’m not a huge fan of peanuts, so I didn’t. You do you, though. 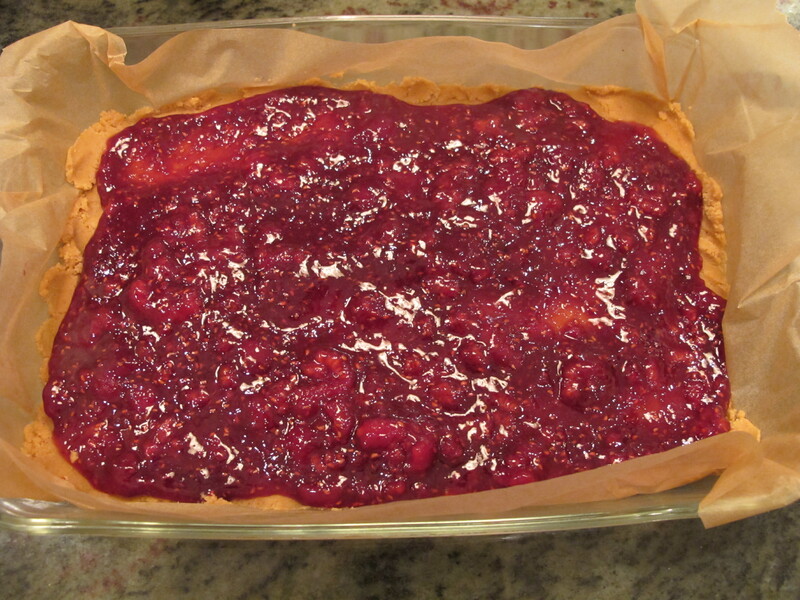 Then comes the fun part – grab chunks of the remaining dough and sprinkle it in pieces on top of the raspberry mixture. Add the rest of the dough this way. Bake for about 40 minutes, or until the top is starting to turn golden brown. When it’s done, let the bars harden for 30 minutes (if you can wait! I couldn’t). If you want, once the bars have cooled fully you can pull the whole thing out by the parchment paper and set on a cutting board, then cut up into bars more easily. The bars are really good with some milk! This entry was posted in Noms and tagged Peanut, Peanut butter, Peanut butter and jelly sandwich, Real Simple. Bookmark the permalink. These are delicious but I’m a Wittelsberger and LOVE the idea of making it with chocolate instead of jelly!